Maybe some damage to enivroment won't be bad? Such as ground pound (to destroy floor on Police Station for example) or one-hit crate crushing? Or slightly increase kick power to throw barrels and crates at enemies. Also, I think that melee weapon is too small and fragile for this brute, so it will break in one hit or something. i have a question will the power up be like this when you get it? What if someone uses the powerup with a super small amount of health and then gets killed while the powerup is active? Will their bodies be all muscular and huge? It'd be fun to kick giant bodies off ledges and down on to unsuspecting players and gib them. Maybe he shouldent be able to hold any meele weapon (Katana+Big musles=killed in 0,5 secs) His fists would be very powerfull on their own. How much should he do damage, 20 HP? If this man will knockout you, you are dead for sure. And he haves bigger knockback. And if he gets hit by a bazooka, will he ride it, or explode to bits, or will it just knockout it? Maybe it shouldent harder to get fire of you with this power-up, to make him weak in some way, with a big body its propably harder to do rolls and they should be less efective. Dodging should be also harder. 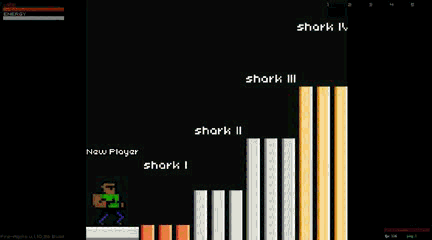 If you do get this power up, will you be able to do a lot of damage diving, and if so, if a normal player and a strong player dive towards each other, will they both stumble? What would happen to unavailable weapons during this time? would you just destroy them on contact, drop them, or would the slots be sealed with cool chain effects to show they are currently unavailable? is this going to be a gamemode? Will the person with the power up be able to lift heavier objects such as the thing that crushes players? how many of these people can be on screen at once? will this person also be able to use mele items or even stronger mele items? shawnu4 wrote: is this going to be a gamemode? What if there was a cooldown when activating the powerup? Like, if it was some pills or food (energy bar, amfetamine, some random space drugs etc) it takes 1 or 2 seconds to finsih themove. On this time you are vulnerable and can't do anything. If someone hits you or throws you with something, the powerup will fly and you will get disarmed. How it sounds? The cooldown freezes the player? It would be nice that with this feature you would be able to pick up larger objects, like crates, desks, pool tables... just like you do while you're "normal" and throw them at other players. And also it would be nice to pick up smaller objects and throw them much faster... with more force. Hi i think this powerup should make player defend from rocket riding, when somebody shoot player with bazooka, rocket will explode that's one of my ideas. Jumpkick to powered player won't do anything because of size. Cool idea. Especially with grappling in the mix, I imagine the Strengthened fighter would be able to throw other fighters a very large distance. Instead of getting knocked over, he's just stagger- but if he staggered off an edge, I think he should go into free-fall like everyone else. So, you could drop-kick the giant guy off an edge and into a vat of acid. Location: I'm...right beside you bro!! IF YOU PLAY SFD I'M COMING AFTER YOU!! By piece, i meant a block of concrete or so. Not very large. He would hold it and push it aside, crushing any player beneath it.